While some signs of aging can be concealed by clothing or makeup, the jowling, sagging skin, and deep folds of an aging face and neck are harder to hide. That does not mean that you have to settle for an appearance that makes you look older or more tired than you feel. Facelift surgery, also called rhytidectomy, lifts and repositions sagging facial and neck tissues for a more youthful, vibrant appearance that better matches the way you feel on the inside. With lasting results and well-placed scars, a facelift can help restore confidence in your appearance so you can more fully enjoy life. Why choose Dr. Conway as my facelift surgeon? A surgeon’s skill, experience, and aesthetic sensibility make a difference in your results. To Dr. Conway, a successful facelift should be undetectable by others as surgery. A natural looking facelift requires a keen eye for symmetry, balance, and tension within the tiny variations in an individual’s facial contours. Prior to becoming a board certified plastic surgeon, Dr. Conway was a medical illustrator, creating visual guides used by surgeons to study the anatomy and intricacies of the human body. This required him to develop a thorough understanding of anatomy as well as an impeccable sense of proportion, detail and symmetry. Combining artistic talent and surgical skill, Dr. Conway focuses on details in a patient’s unique features to produce decidedly natural facelift results. How do I know if a facelift will help me? Patients often come into our office with this question first and foremost in their minds. 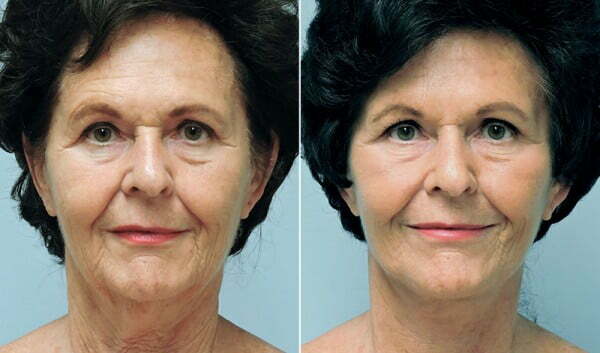 Many are unhappy with jowling and skin laxity but wonder if they are too young for a facelift. Others are bothered by wrinkles around the eyes and mouth and wonder if a facelift is their only option. The truth is, there is no right (or wrong) age for a facelift—Dr. Conway has worked with facelift patients in their early 40s as well as those well into their 70s. You feel that an aging appearance is holding you back socially or professionally» By helping you look younger, fitter, and better refreshed, a facelift can boost your self-confidence and help others to get the right impression about you. Dr. Conway will help you decide the right procedure plan for you based on your unique anatomy as well as what changes you would most like to see in your face, whether or not that includes a facelift. With so many wonderful new options to smooth wrinkles, tighten skin and rejuvenate the face without surgery, you may wonder if it is still necessary to have a facelift. While non-surgical facial rejuvenation procedures can help you look younger, they cannot substitute for the dramatic lifting possible from a surgical facelift. With that said, Botox, fillers, and laser skin resurfacing are excellent complementary treatments to facelift surgery, allowing Dr. Conway to offer many options. How much does facelift surgery in Asheville cost? Costs for facelift surgery vary depending on the individual patient and the procedures performed. If you are having a limited incision facelift alone, for example, surgery will cost less than if you are having a standard facelift with a neck lift and cosmetic eyelid surgery. On average, a facelift with Dr. Conway in Asheville will cost between $4,000 and $10,000, which may include brow lift or eyelid surgery. Your total fee includes surgical fees, operating room expenses, and anesthesia fees. At your personal consultation with Dr. Conway, you will be provided with a detailed fee quote, which is good for 6 months after your consultation date. Dr. Conway performs advanced facelift surgery techniques that are designed to last for years. Excess skin removed during a facelift is gone for good, and the underlying tissues are repositioned. The natural aging process will continue, and over time you may notice some reduction in skin laxity and volume loss. The good news is, that any visible aging after a facelift will be starting with your “aging clock” set back about 10 years, so you will continue to look years younger at any age than you would have without a facelift. Patients who have a facelift in their 40s or 50s may enjoy the results of their initial facelift for several decades before choosing to have a second procedure to refine their appearance. In many cases, Dr. Conway can perform a secondary facelift using limited incisions and a less extensive procedure with a shorter recovery. Each patient considering a facelift begins by meeting Dr. Conway for a personal consultation. During this appointment, you will meet Dr. Conway’s patient coordinator, Maria, and his nurse, the same team who will be working with you throughout your plastic surgery experience. Dr. Conway will begin by listening to your reasons for considering surgery and what you hope to achieve. After examining your face, he will explain your procedure options and answer any questions you may have. He may also take “before” photographs to help him devise his surgical plan. After meeting with Dr. Conway, you will be given an individualized fee quote. If you wish, you can talk with our financing coordinator to go over your options for payment or financing. If you are ready, you can schedule surgery, or if you prefer, take time to think about your options. Dr. Conway performs facelift surgery at Asheville Plastic Surgery Center’s on-site, fully accredited surgical suite. Your procedure may be done with general anesthesia or intravenous sedation and local anesthesia, or quite often can be done with oral sedation and local anesthesia, depending on your needs and the extent of the procedure. General or intravenous anesthesia is administered by a board certified MD anesthesiologist. Dr. Conway will begin surgery by making small incisions within the natural creases in front of and behind the earlobe. For more extensive procedures, incisions may also extend past the ears, hidden behind the hairline. If you are having a neck lift at the same time, he may also make a small incision just beneath the chin. Through these incisions, Dr. Conway will separate the skin from the underlying facial tissues; doing so allows him to tighten and reposition the deeper facial tissues and then redrape the skin with a natural tension, thus avoiding a “pulled” look. Your procedure plan may include fat removal under the chin and possible fat injections to restore lost facial volume, Dr. Conway will perform them at this time. Excess skin from the cheeks, jowls, and neck, will be removed, and Dr. Conway finishes the procedure by re-draping the remaining skin in a natural position. You will go home from your procedure wearing a compression dressing around your forehead and over the ears and underneath the chin (many think of the head-dresses worn by the nuns in the Sound of Music). You will likely feel sore and notice a tight sensation around your face initially. Bruising and swelling are also common; these effects should begin to gradually subside after a few days. You will need to sleep in an inclined position, on your back for the first few days after surgery, and refrain from showering until your follow-up appointment with Dr. Conway, where your bandage will be removed (usually 1-2 days after surgery). With proper aftercare, facelift patients are typically back to non-strenuous daily activities and feel ready to go out in public within 2 weeks of surgery. Most of the swelling and bruising should be gone in 10-14 days, at which time remaining discoloration can be concealed by camouflage makeup. It is important not to lift or strain for 3-4 weeks following surgery, even if you feel up to it. Your incisions are continuing to heal at this time, and following Dr. Conway’s instructions will help to ensure optimal final results. If you are considering your options for facelift surgery in Asheville, NC, we invite you to schedule a personal consultation with Dr. Donald Conway. He will listen to your goals and concerns, answer your questions, explain your options, and help you choose a treatment plan that best suits your needs.